Michael Romano's Union Square Cookbook is one of the best I have seen. It was our Bible when my wife and I spent three years in Tokyo. Romano's sequel, Second Helpings from Union Square Cafe, is also good, but not as groundbreaking. 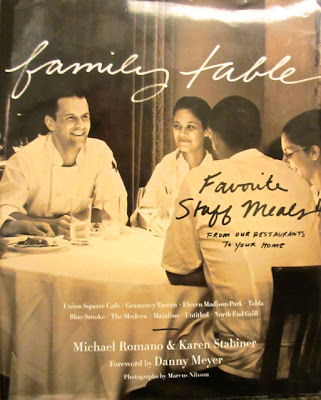 Romano has just released a new cookbook, Family Table: Favorite Staff Meals from Our Restaurants to Your Home, written with Karen Stabiner. Family Table presents recipes for a number of meals served to the staff of the extraordinary restaurants in the Union Square Hospitality Group: Union Square Cafe, Gramercy Tavern, The Modern, Maialino, Blue Smoke, Tabla (no longer with us), Eleven Madison Park (no longer part of the same group) and North End Grill. Having just read it from cover-to-cover, I was most impressed by the obvious quality of the recipes -- you can see that the excellent editing of the earlier books is maintained here; the eclecticism of the recipes (Italian, American, Asian, South American, Indian and other ingredients working together in harmony – if only the world’s countries could do the same! ); the inside stories that gave a context to many of the recipes that make the reader (me) want to try them immediately; and the overall humanity and respect, not just for great food but for the people who prepare and serve it, evidenced on nearly every page. For example, the story of how Farro & Beans came to be honors Geoff Lazlo’s skill and ability to improvise, while Joe Anthony’s approach adds piquancy to his Penne with Fennel, Spinach & Golden Raisins (a riff on a Sicilian classic). And who would not want to try Iris Battista’s tried and true Dominican Chicken or enjoy Floyd Cardoz’ five-generations old Goan-Spiced Braised Pork? Similarly, the stories behind Gabriel Kreuther’s Roasted Potatoes with Fromage Blanc & Bacon and Prizewinning Apple & Pear Tart have moved these recipes to the top of my “To Cook Soon” list. There are many other stories and related recipes that I could cite, but you get the picture. Most of the dishes featured in the book bear little resemblance to the complex and meticulously prepared and finished dishes one finds in the restaurants in the Union Square Hospitality Group. But Romano's book shows the close connections, mutual respect and shared sense of purpose among the members of the teams that conceive, prep, cook and serve the wonderful meals for which that group is renowned. Those connections and that respect, which must be instilled from the top, are what make it all possible.